No trip to Melbourne is complete without a drive to Great Ocean Road (GOR), one of the world’s most scenic coastal drives! We did our day trip with A Tour with a Difference, which was a company run by a lovely couple. Grace was our guide for the day, and there were 5 of us in this tour today. Being a small company, they take in a maximum of 11 people for each tour, so we were really lucky to have such a cosy size, for that meant we were all very comfortably seated in the 7-seater Mercedes! We gathered at a common location for pick up around 7.30am. From there, it was a 1.5 hour drive to our first stop for morning tea break, with Grace giving explanation and pointing out to various location of interest throughout. Morning tea (pee- 🙂 ) break was at Bell’s Beach where surfers would gather on this long stretch of ocean front to surf their hearts out whole year round and is also the venue for a annual international surfing competition. Grace laid the picnic table with crackers, Vegemite (a yeast extract much similar to the Bovril beef essence that we were used to when we were young), traditional Lamington Cake (an Australian dessert or snack, typically made with squares of sponge cake coated in an outer layer of chocolate sauce and rolled in desiccated coconut), and of course Tim Tams. She then proceed to brew some fresh Aussie Bush Billy Tea, which she placed in a billy (bucket), filled it with hot water, and demonstrated the Australian tradition of swinging the billy to get the tea leaves to the bottom! The hot tea was then poured directly into mugs and we enjoyed the wonderful tea with the snacks and a gorgeous view! It would be another 1.5 hours of drive before we arrived at Grey River Road along the Kennett River. Along the way Grace stopped at some unique houses for us to take pictures (one of them has a over-hanging living room that overlooks the ocean). We also stopped briefly at the Great Ocean Road Memorial Arch (the picture at the start of the post) which is a tribute to the World War One servicemen who built the Great Ocean Road. The area around Grey River Road along the Kennett River is full of Eucalyptus (or Gum trees) so lots of wild koalas gathered here as their natural habitat (as opposed to those being reared in sanctuaries). We managed to see 4-5 koalas high up in the trees, just hugging on the branches and nua-ing away. We were told that there were more koalas in the past but they had been eating away the leaves faster than the leaves can grow so the rangers had to resort to killing those sick and weaks ones away, so that the healthy ones can survive. Besides koalas, there were also many colourful birds in the area. Grace took out some bird feeds and in no time, the birds were flocking around her going after the feed! Our lunch pit stop was at the bistro in Apollo Bay Hotel. It was undergoing some renovations in the kitchen, but Grace had called in advance to place orders, thus we did not have to wait long for our food. The roast of the day was Roast Beef, which was quite alright. While the Chicken Schnitzel was not exactly flattened chicken breast, it was actually a pretty delicious chicken cutlet, and the breast meat was not dry. The lemon bitters was quite sweet for us, but we quite liked the dry ginger drink. After lunch it was another 40 minutes drive to Maits Rest Rainforest Walk and we took some time to hike through the beautiful fern gardens with giant rainforest trees up to 300 years old (also partly to digest the lunch away 🙂 ). There are wooden boardwalk over the moss-covered roots of ancient rainforest trees for easy walking and we rather enjoyed the commentary from Grace who is an avid gardener and lover of rainforests! Given the high density of rainforest growth over this area, we also experienced lots of rain throughout our short walk! After the wonderful hike, it’s another hour of scenic drive and rain started when our heart went ‘Oops’. But the rain stopped just before we hit the beach at Gibson Steps (named after local settler Hugh Gibson, who worked on the route originally used by the Kirrae Whurrong people)! Talking about lucky! We walked 86 steps down to the beach and was awed by the sheer beauty of nature with 70m high vertical cliffs and fine sand (which kinda reminded us of the world-famous Reynisfjara shore, near the village Vik, which is widely regarded as the most impressive shore in Iceland)! There’s also the spectacular Gog and Magog, the nicknames given to the giant limestone stacks rising up out of the sea. 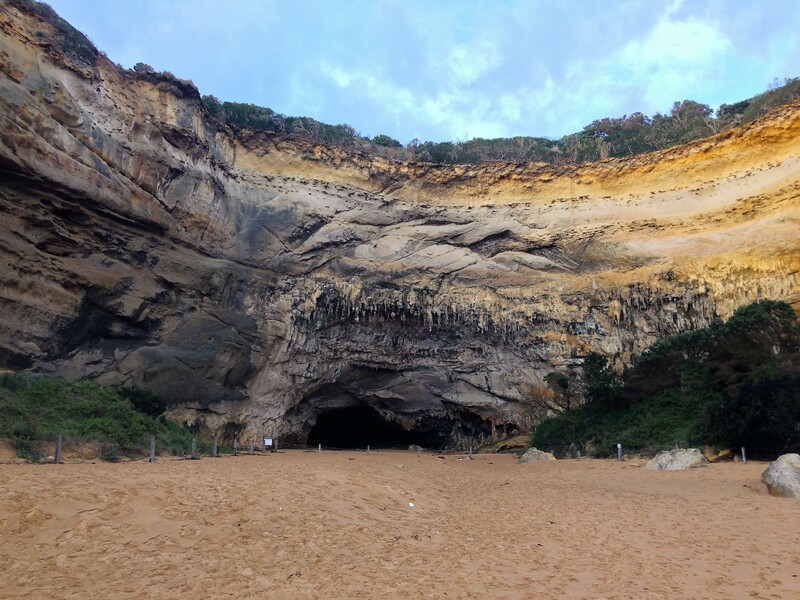 After half an hour at the beach, and another half an hour of drive, we arrived at the highlight of the tour, the 12 Apostles, a collection of limestone stacks formed by erosion! The view was simply gorgeous and magnificent! We walked along the boardwalk and was shutter-happy and kept clicking away. Too bad the sun was facing in our direction so we were not able to get better pictures. But it has definitely cast a great impression in our minds! 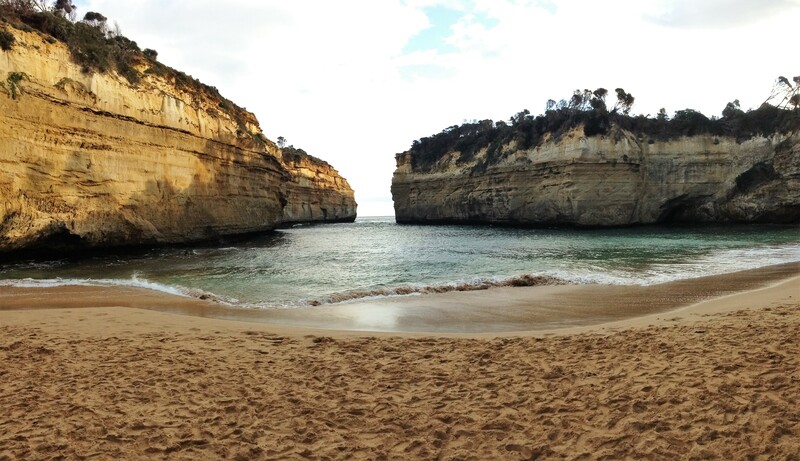 From the apostles, we also visited Loch Ard Gorge and London Arch (formerly London Bridge) just before the sun started to set. As part of the tour, we had dinner at Waves Port Campbell, a family business that opens all year round, have their own farm and offers lodging too! The hot chocolate here was lovely, not overly sweet or strong. 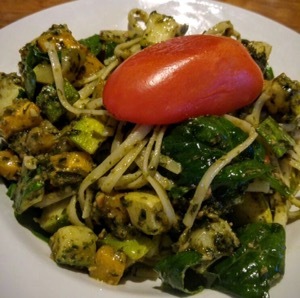 I totally enjoyed the vegetarian linguine, for all the vegetables were so fresh and sweet! The fish and chips was also quite good; the fish was lightly battered, and the chips in Australia is wayyyyyy better than Singapore. It was a 3-hour drive back to Melbourne city in (almost) pitch darkness and we reached home at 9pm.